London based entertainer Chris Murphy has developed a fast paced 60 minute educational Blues Show that is age appropriate for elementary school students. The show has been kid-tested at more than 100 schools and could best be described as EDUTAINMENT. 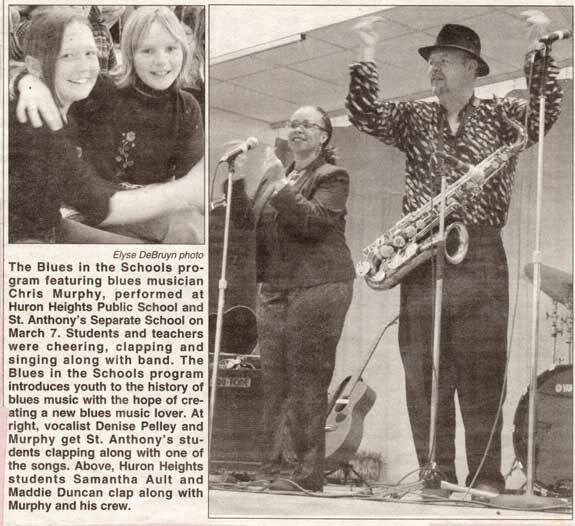 The interactive presentation introduces the students to the history and cultural significance of blues music. Blues music originated in the Southern United States in the late 1800’s when African slave traditions mixed with European culture. The music has undergone many changes over the years and continues to be a major influence on popular music and culture in the 21st century. The show features 6 of London’s most accomplished full-time professional entertainers including: actress and vocalist Denise Pelley. Students participate in an interactive songwriting exercise, sing some response vocals and enjoy learning about the history of this great art form. At some schools a student with musical talent may be asked to jam with the band. The show is priced to be affordable and has been staged more than 100 times. About half of the performances have been in the London area. 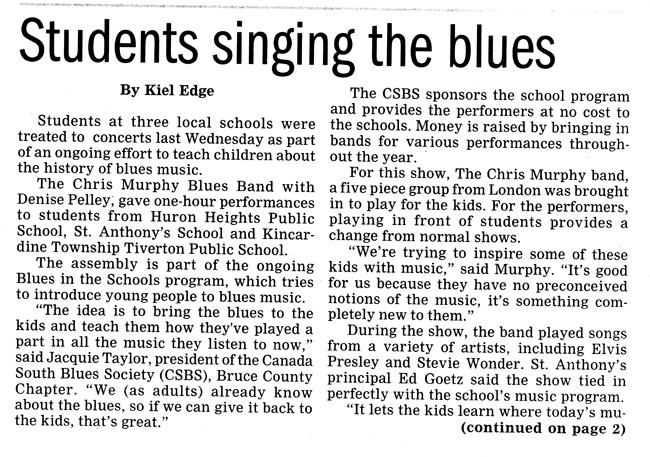 The show has also been performed in: Stratford, Simcoe, Brantford, Woodstock, Exeter, Clinton, Kincardine, Owen Sound, Caledonia, Strathroy and Burford. Note: Some schools may qualify for co-sponsorship funding. The entertainers provide all of the sound equipment. 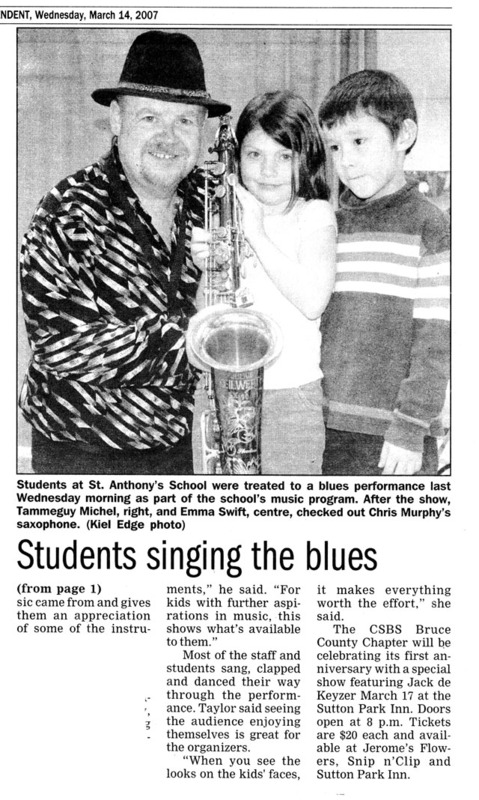 Blues In The Schools on A Channel. Ted was the winner of the Maple Blues Award in 1998 as Canada’s finest Blues Guitarist. He is a member of Juno Award Winning Band Fathead. 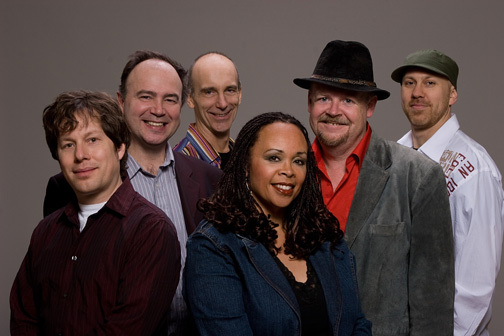 He also tours in Canada, the United States and Europe with Paul Reddick, The Maple Blues Revue, The Village Blues Band and Pork Belly Futures. Kim has a music degree from Humber College and is one of London’s most in demand bass players. Ted has music degrees from both the University of Western Ontario and Humber College. He has recorded with Juno nominated Big Daddy G, The Bill Durst Band, Suffer Machine, Chris Murphy and Emm Gryner. He is the leader of the his own band, Soul Bender, and also performs with the VIllage Blues Band. All traditional gospel blues tunes. C Houndog / rock & roll in the style of Elvis Presley.